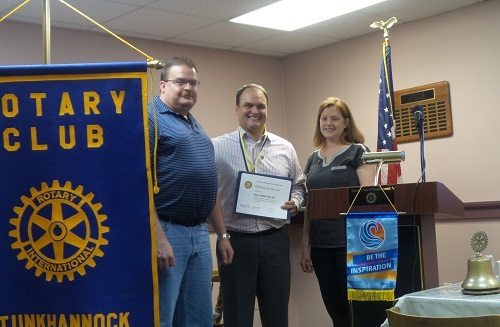 At the Sept 13 Tunkhannock Rotary luncheon, a special Paul Harris Fellow presentation was made to Rotarian Rod Azar. Past President Samantha Maruzzelli presented a Club Designated Paul Harris Fellow certificate and pin to Rod for his outstanding work on club projects, especially resurrecting the Rotary Relays. Club President Mike Markovitz then gave Rod a Paul Harris Fellow medallion for him to wear to Club and Foundation events. Rod thanked the club for this special award.